A customer recently contacted 1967beetle.com. Eric asked that I field the inquiry; it was in Spanish! Yes, I still can make some head-way in Spanish. And, it just so happened that this customer lives in Colombia, South America—a place where Neva and I lived for 14 years! Like “going home”. I breathed deeply, then lit into a reply to Padre Santiago, the proud owner of a 1967 Beetle; yes, these trusty little cars are to be found the world over! The trouble stemmed from a faulty driver’s door locking mechanism. 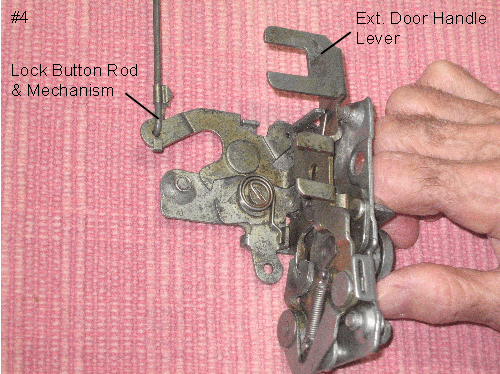 Padre Santiago had purchased a reproduction ’68-and-later door mechanism that is supposed to work for the ’67 door too, “after a slight alteration”. After attempts failed to produce a reliable mechanism, the Padre turned to 1967beetle.com. I replied, saying that I would do my best to locate a working mechanism and thanked the Padre for his patience in advance. Thus began a journey that would take me in a completely unexpected direction. Join me, if you will. My first attempt to find the mechanism was to a local shop, known for carrying many door parts. This yielded not a thing. Next, I called my good friends, Dustin and Cassie Carter at Don’s Bug Barn in Athens, Texas. “Yes,” Dustin told me, “I most certainly can supply the necessary piece!” Great—a hurdle jumped. When the piece arrived, Dustin already had done a lot of cleaning. I let the piece sit in a bucket of old-school carb cleaner for a couple of hours, retrieved it, washed the piece and dried it thoroughly. Sparkling! I sat at my work bench operating the mechanism to observe the function. After some lubrication, I had all parts loosened and moving. However, the “claw” which grasps the post on the B pillar would not release. I spent a couple of 30 minute sessions just operating the mechanism to learn how it works. 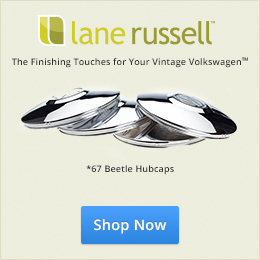 VW engineers were tasked with building an almost entirely new mechanism for ’67 Beetles. 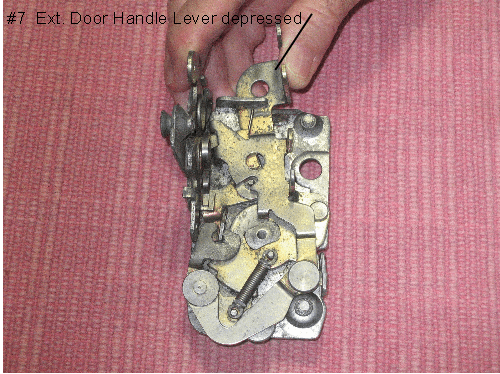 Whereas for previous years doors had been locked using the inside door handle (pushed forward into the locked position), the new mechanism must have a locking knob (button) at the window sill. To lock the door, a person must push the lock knob down and, while holding the door handle button in, close the door. The door was locked. But, should the lock knob be depressed and the door shut by itself, the knob would spring up automatically. This was a safety measure designed to keep a person from accidentally locking himself out of the car, perhaps locking the keys inside. The door handle itself was redesigned and became a one-year-only part. I found 4 types of springs in the mechanism—each with a separate purpose. 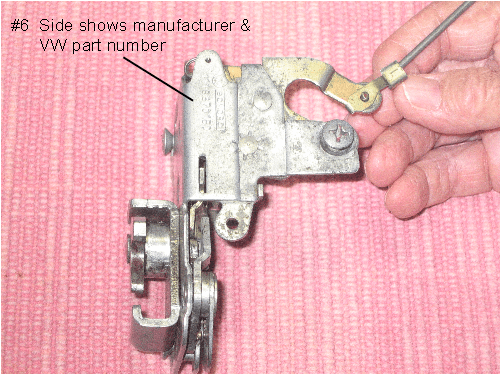 The problem, I determined, was that the handle activated lever on the mechanism could not travel far enough to actuate the pawl release. What to do? I contemplated using a file to remove a tiny bit of the lever stop so that the lever could travel farther. No—this could thwart the door handle making it have to move farther than it was designed to do. More study revealed a wear mark. Now, I was arriving at the key to the problem. 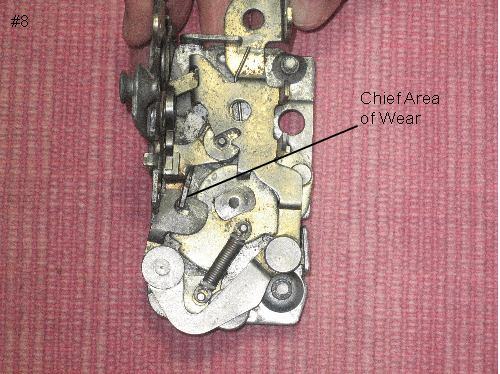 The wear was the result of the release lever’s being brought to bear upon the pawl release—which was under great pressure by one of the springs. I could see that there was about the same amount of wear on the release as there was area needed to clear on the ratchet. 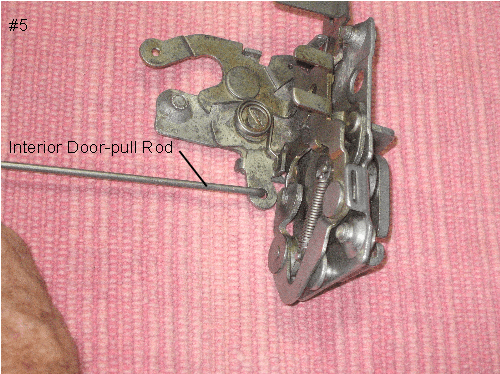 Every time the door was closed over the years, that spring caused the pawl lever to snap against the release lever, resulting in an ever-increasing wear spot. The next time I had opportunity, I sat again to study the mechanism. I discovered a second high-wear area. Now, I contemplated how to replace the worn metal. 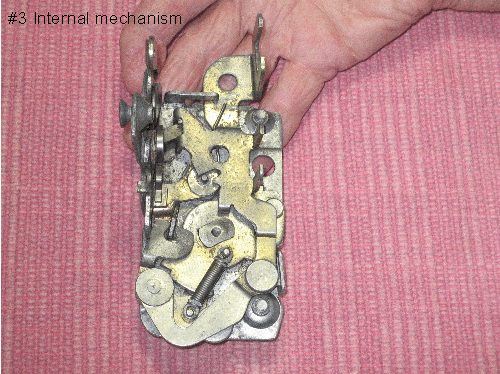 The mechanism is firmly factory bradded together—to disassembly would be time-consuming and disastrous. There had to be another way. I headed to my trusted VW mechanic’s shop to pick his brain. I found him to be completely immersed in engine building. Not to bother an engine builder in such a situation. I had planned to go to the automotive collision shop next door anyway, so I went there now and found both of my good friends available to examine the mechanism. To speed things along, I explained the situation, pointing to each function—then to the worn points. Mike took the mechanism and began examining it intensely. Soon, he pointed to a third wear area. The cumulative wear resulted in exactly the amount of distance which the pawl could not travel. Now, we had but to determine a method for restoring that lost metal. And, these two experts agreed that to disassemble the mechanism would not be profitable. We agreed that there was one key area, which, if it could be altered, showed the most promise. Mike had a suggestion. He and Geoff discussed the possibilities and agreed that it was likely the only recourse. Since the piece could never function as it was, I agreed as well. I have watched these two ply their trade for many years—they know metal and how to work it. I turned the piece over to Mike while Geoff and I examined a 1941 Chevy Pick-up in the shop. I hardly noticed Mike until he was turning off his torch and had picked up a pair of strong slip-joint pliers. Then, he went to the sink to cool the piece. Voila! The mechanism worked like a charm! I fairly danced a jig right there! 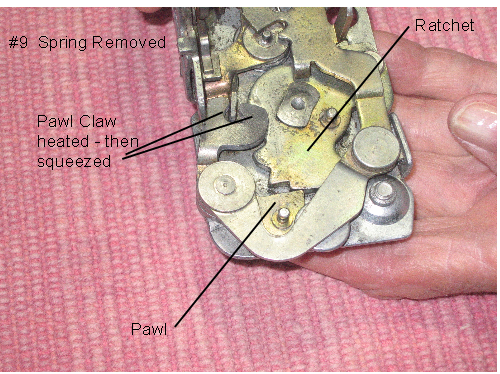 What Mike suggested was that he heat the “claw” of the pawl until he could squeeze it a tad to make up for the loss of metal wear. A cheaper and more efficient method could not be imagined. I was thrilled. Now, I had my working mechanism, which should operate for another-how-many-years! These men know how to use a torch to achieve optimum heating, yet not enough to damage the mechanism. One caution: remove the pawl-ratchet spring prior to heating. The torch heat is enough to damage the spring tension. The Padre will have an original German mechanism for his prized ’67 Beetle. 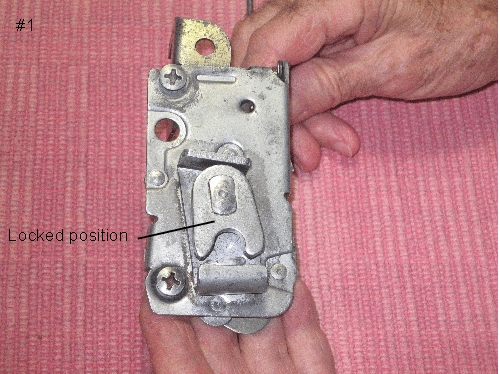 In order to understand how the door latching mechanism operates, follow the sequence of photos below, noting the captions. This will guide the reader to the concluding photo where the pawl is heated, then squeezed to remove the “play” created by wear. Dustin and Cassie Carter of Don’s Bug Barn (a Volkswagen salvage yard) in Athens, TX, gave special attention to the removal, cleaning and shipping of the correct ’67 door mechanism for this project. Geoffrey Lohmann, owner of Christian Brothers Quality Collision Repair of Garland, TX, and his long-time co-worker, Michael Minchew, took time from their busy schedule to diagnose and remedy the non-functioning mechanism. Fantastic Article, Jay. You amaze me with your level of effort to the ’67 Beetle community. Your check is in the mail, once again. Awesome article. Thanks for sharing!!! Another great article for my records – thanks Jay!. My winter project is to remove the chrome trim off the windows of my 1967 convertible and send them off to get rechromed as they are showing 48 years of fun in the sun. Are there any articles in the archives on pulling the windows and then the chrome that may save me some grief? Norbert, Jay & Eric … this is one of the projects on the “To Do For Wally2” list. Have replacement chrome window trim from WW so we’d be interested in any insights or tips for replacing window trim. Good evening, Norbert (my first reply failed–here goes again). I do not recall any article(s) on the Site which deal with the process of removal of and re-chroming of the window trim of the Convertible Beetle. This will give me the incentive to get mine right. You did it again Jay. Very informative and well written. The pictures from Neva certainly add to that special touch which makes the article that much more clearer. Always enjoy your articles. This one will join the rest in Linda’s folder. Once again I have found exactly what I had been looking for. I just completed a similar project on my drivers door..on to the passenger side. Excellent documentation on the entire process, including photo’s. Many thanks. Good job, Frank! This problem had not surfaced in my experience until recently. The usual thing is to toss the part and try to find a good replacement, right?. But, as you know, another used one is going have this problem sooner or later (I think)–the more use, the more the wear. Doesn’t it feel good to have resurrected yet another German part! I know that some would think us vintage people to be crazy–but, it’s a good crazy. LOL Thanks for chiming in, Frank! Gracias Jaime por el artículo y por ponerse en la tarea de buscar, encontrar y revisar este mecanismo que, estoy seguro, dejará como nuevo mi VW Beetle 1967. Congrats on a job well done! Of course, Gary and I are wondering if a victory dance video will be far behind? Hey Jay, greetings from Singapore! This just happened to me this morning. Googled the problem and landed right on this page. Amazing stuff again from 1967beetle.com. Will be working on it this weekend! Hello and thanks for the info. 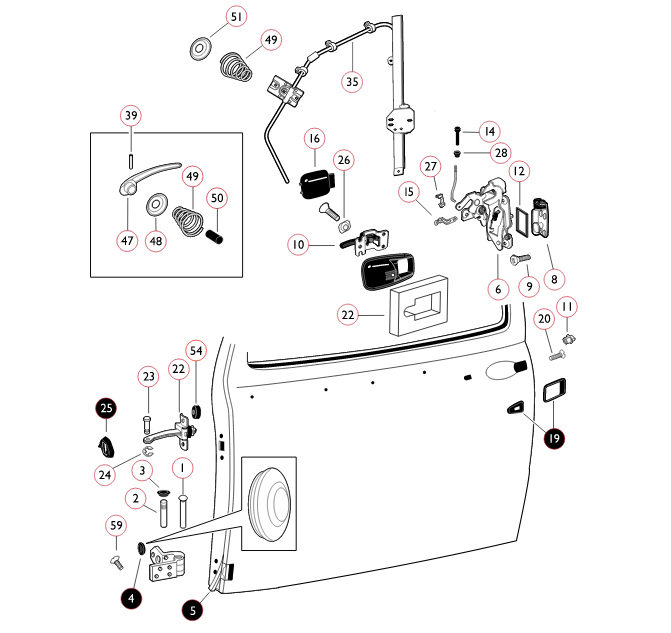 My problem is I just got a 67 beetle and the passenger door lock system is entirely stuck. Outside thumb/key doesnt work…Inside door lock does not go up and down…inside door panel latch does not pull out…I locked it today…felt weird but didnt think much of it till trying to open it. A side note…I pulled the outside handle assembly off to detail the outer rubber seals…had a little overspray and put it back into the door…any feedback would be great! This is a fantastic resource. 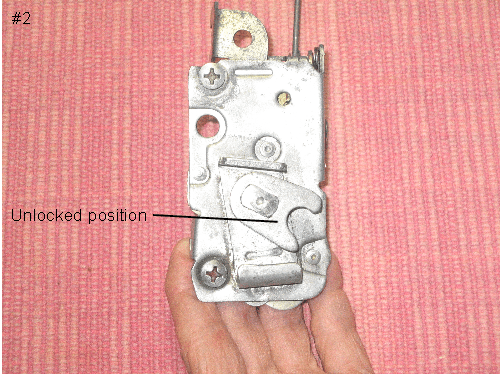 Any hints on how to get the mechanism out of the door?